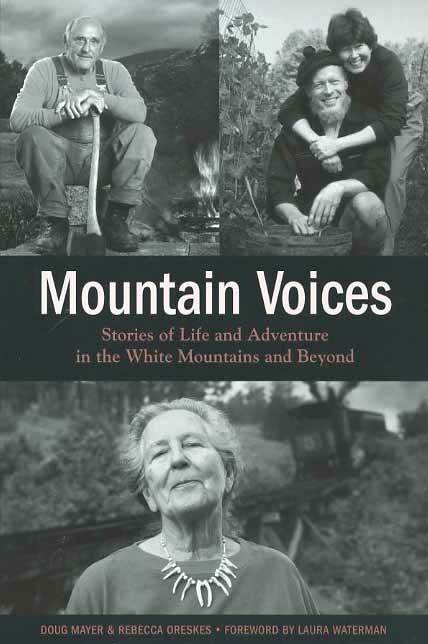 Mountain Voices, by Doug Mayer & Rebecca Oreskes, 2012. "Stories of Life and Adventure in the White Mountains and Beyond." The authors profile and interview 15 icons from the White Mountains, collected from a series of articles in the AMC journal, Appalachia. The stories are divided into four sections: Mountaineering, Conservation & Wildland Ethics, Life on the Trails, and Work in the Whites. Among those profiled are Brad & Barabra Washburn, Guy & Laura Waterman, Karl Limmer, Ellen Teague, Rick Wilcox and Paul Doherty. 248 pp., 6" x 9."